On this day in 1940 a NAZI Secret Weapon was discovered along the Yorkshire Coast in Bridlington. In the shape of a torpedo the object had two propeller fins at one end and a portrait of Neville Chamberlain the then Prime Minister complete with Umbrella sculpted on it at the other. 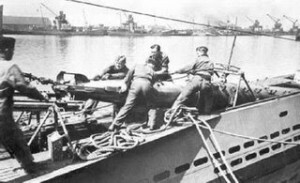 The torpedo was thought to have a dual purpose in that if it missed its target the device would become a sort of mine. It is assumed the device was dropped into the Bay by a German Bomber a week earlier. The bomb was found by a Mrs Mary Thompson and her sister whilst taking her dog for a walk along the Cliffs. On spotting it she immediately informed her husband a Special Constable who in turn contacted the relevant authorities. Mrs Thompson hopes to be the first person in the country to receive the Admiralty Award of £5. The article also adds that the weapon is the first of its kind to be found on these shores and that last October a Danish expert had the belief that the Germans were working on a new type of delayed action torpedo as well as a new form of armour piercing device. It is only fair to point out that at this time Britain was still in the part of the war known to Brits as ‘the phoney war’. The Battle of Britain was still 3 months away and although Chamberlain had declared war some months earlier, for most civilians living in Britain it didn’t feel like war, hence the term. So it is no wonder when an unusual bomb dropped on our shores the papers exaggerated its importance. I would also like to add I have looked everywhere online to try and find out more about this weapon/story but to no avail, so if anyone could shed any light on it please leave a post in the comments section below.